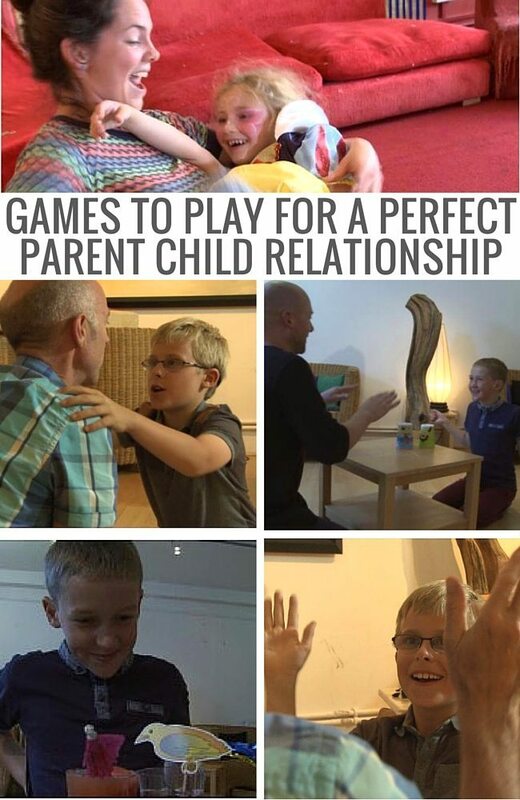 love the attachment play and having watched the DVDs, parents often say they feel a new confidence and excitement in relating to their children in ways that really deepen their attachment bond. 2) For older children adjust the level of skills involved in the attachment play according to the age and ability of the child. 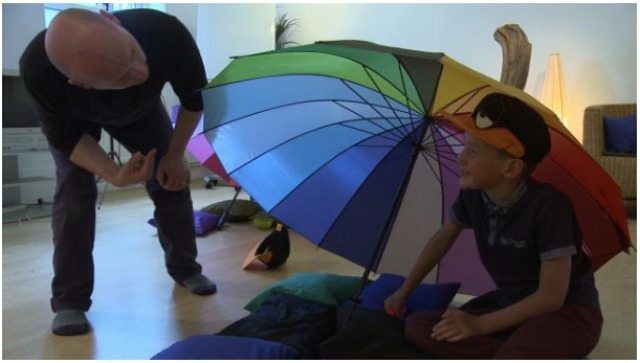 Make sure it’ s challenging, (to avoid older children feeling ‘ silly,’ although in actuality this rarely happens) but not so much so, that anxiety about performance kicks in. Give your child a menu of animal rides (see below) to take them to bed or get them up in the morning, starting the day with giggles rather than grumpiness.For example, you might ask, “Do you want a Wonky Stonky Tickle Ride or a Gruffly Goat with Giggles Ride?” Or ask them what animal they want you to be whilst they ride on your back. The nine- year old boy on the picture below on the right has just asked Dad to be a grizzly tiger. The eight year old on the left has asked Dad to be a ‘ Emergency Exit man”!?! On the DVD “there are lots of giving and receiving games (parent to child and the other way round). Here is one of the giving games, in which the task is for the child to make a lovely (juice!) cocktail in three minutes flat, for his father, who accompanies him with a drummed appreciation song! In this game parent and child each make an umbrella house (large golf size umbrellas) with the embellishment of snacks and blankets. Then who ever is going first, invites the other person into their house. The invitation can be accepted and the snacks shared whilst conversation flowing. But if the invitation is declined, it’ s because the invited person has said they are a duck. If this happens, both people do a duck dance around the umbrellas, (enhanced with duck whistles and duck caps). We found that even twelves year olds loved doing this with their parents. You need two plastic cups turned upside down, and a firm table. Set up a spontaneous improvised band 3 together, to the rhythm of Mooga Chuga Mooga Chuga (repeatedly chanted) using cup sounds and clapping. rhythms interchangeably. Research shows that physical attachment play can activate brain fertilisers, which develop the executive functions in the higher human brain. This sort of play also triggers optimal levels of pro-social brain chemicals (anti- anxiety and anti-aggression chemicals). This is why when we want good behaviour from kids; playful parenting is far more effective than punishing parenting. There are lots of ideas for physical attachment play on the DVDs. As an example, here the parent and child (age 9) are playing “Shimmy Shimmy Cocopap. Secret Animal up your back. Which animal did that?” It starts with a lovely shoulder and arm wiggly contact! Then you simply take it in turns to draw an animal on the other person’ s back (with or without sounds) and ask your partner to guess what it is. Put your child on your lap and say you’ve got something on your knee. E.g. “I’ve got a rolling pin on my knee”, “I’ ve got a horse on my knee”, “I’ve got a seesaw on my knee” then use sounds and movements associated with that object or living creature, and hear the child’ s shrieks of delight! Or ask the child what they would like you to be. 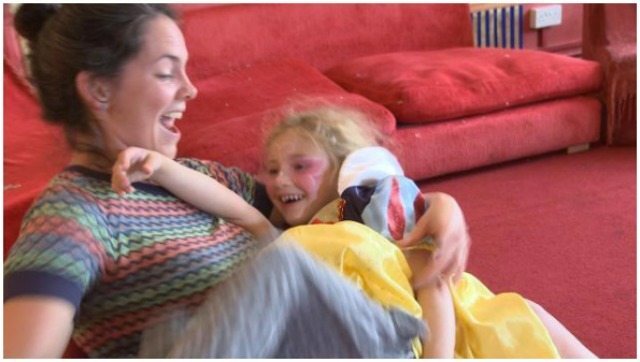 The six-year-old in the picture above asked her carer to be ‘ twinkling stars’ and roared with laughter for a long time when twinkling stars descended in funny tickling all over her arms and legs. Where can people find more information about your DVD or your work? Hi, Helen Great post. You have just included everything in a perfect way. Really liked your writings.